As counterfeiters get better and better at faking expensive Swiss watches, the watchmakers themselves now have a new tool to help distinguish their genuine creations from fakes: nanoscopic watermarks that are invisible to the naked human eye, and impossible to fake. A company called Nanoga has developed a new process where nanophotonic layers—10,000 times thinner than a human hair—can be deposited on a watch’s sapphire crystal or glass dome as highly-detailed imagery using a lithographic printing process. Under normal lighting conditions the holographic image that’s produced is invisible to the naked eye, so an expensive watch’s face and complications are not obscured. 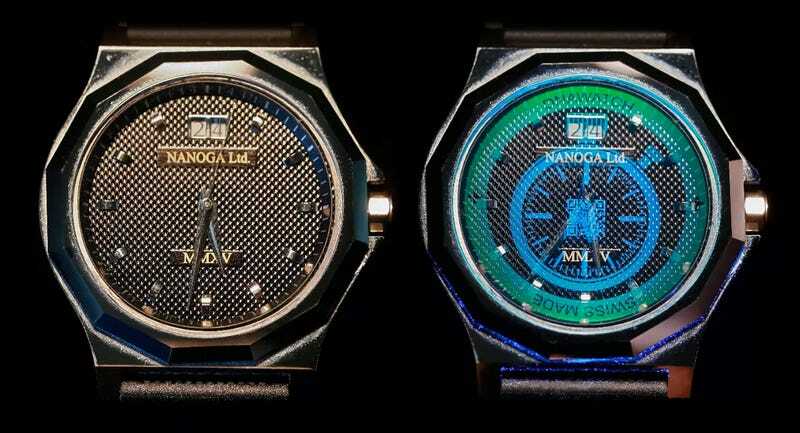 But hit it with an ultraviolet light, and suddenly the watermark becomes visible, confirming a timepieces’s authenticity.